Running back Tim Hoopes came to Carey High School from South Fremont in St. Anthony for his senior season, so Friday's Sawtooth Conference grid game was his first glimpse of the Carey-Mackay rivalry. As it turned out, Hoopes wasn't intimidated a bit by the eight-man football rivalry and the Mackay defenders had several disheartening glimpses of Hoopes' rear end disappearing downfield on a mild night at Derrick Parke Memorial Field. Hoopes (11 carries for 239 yards) scored four of Carey's five touchdowns—three coming on runs of 45, 70 and 65 yards—leading Carey to a 34-0 thrashing of Mackay. The Panthers ended up out-rushing a tough Mackay squad at a 310-182 rate. Carey (7-1, 4-0 league) posted its third shutout of the season and clinched the Sawtooth Conference North Division title with only a league road game at Richfield (2-5, 1-3 league) remaining on Friday, Oct. 29. Tenth-year Carey coach Lane Kirkland (81-19), celebrating his 100th game on the Panther sideline, said, "I thought our defense did a tremendous job shutting down Mackay's run and containing the pass. "Our linemen led by Blair Peck dominated the line of scrimmage and made lots of tackles for a loss. Mackay ran 68 plays and had a 34-14 advantage in possession time but we kept them out of the end zone. "I was quite impressed with Mackay. They have a good coaching staff and had a good game plan for us—running the ball and limiting our possessions. But our rushing attempts were very effective and we mixed in a few screen passes to give ourselves good balance." Leading scorer Hoopes (17 TDs, 110 points) had his best offensive game and contributed eight tackles to Carey's busy 71-tackle evening. He did it against last year's State 1A Division 2 runner-up Mackay (3-3, 2-1 league), which lost its second road game in two tries. His first touchdown run covering 45 yards came on a first-quarter dive behind a crushing double team block by the Panther line on Mackay's fine lineman Dallin Pearson. The second Hoopes TD in the second period came on a right end shotgun option where the shifty 5-8, 160-pounder made a couple of moves to free himself in the Miners' secondary. Kirkland said, "Tim moves from side-to-side really well." Junior Charlie Rivera (10 carries for 68 yards) added a five-yard touchdown run for a 20-0 Panther halftime lead. Hoopes was off to the races on 70-yard and 65-yard TD dashes in a 42-second span that broke it wide open in the third. Carey earned the North's top seed for the State 1A Division 2 playoffs. Kirkland said Carey intends to host that game Saturday, Nov. 6 at 1 p.m. against the loser of this Friday's South Division championship game between visiting Castleford (7-0, 4-0 league, 56.4 ppg) and host Rockland (7-0, 4-0 league). Kirkland said he intends to watch Friday's Rockland-Castleford game because the Panthers have a bye. "We'll watch them to get a better idea of what they can do," he said. The winner of Friday's Castleford-Rockland clash will open the playoffs by hosting the second-place North Division team, which most likely will be either Mackay or Dietrich (5-3, 3-1 league). Mackay hosts Clark County (3-4, 2-2) Friday, Oct. 22 and goes to Dietrich Oct. 29. Since the Sawtooth North/South group gets five playoff berths this year, the third-place teams in the North and the South will clash Monday, Nov. 1 in a 24-minute, one-half game at a neutral site. Murtaugh (5-3, 4-2) has already clinched the South third-place position and will probably play either Mackay or Dietrich. If Mackay loses at Dietrich Oct. 29 and ends in third place, the Miners and Murtaugh will play their loser-out game Monday, Nov. 1 at the Carey field. Friday's Mackay game was "Senior Night" recognizing eight seniors—Shane Bingham, Caleb Cenarrusa, Jacy Baird, Joe Laidlaw, Lynn Mecham, Tim Hoopes, Blair Peck and Brandon Dilworth. Rushing—Tim Hoopes 11-239 (21.7 per carry), 4 TD; Charlie Rivera 10-68, 1 TD, 1 conv. ; Caleb Cenarrusa 4-3. 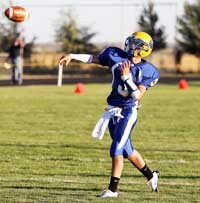 Passing—Caleb Cenarrusa 6-13, 108 yards, 1 interception. Receiving—Shane Bingham 4-47; Charlie Rivera 1-31; Dillon Cenarrusa 1-30. Sacks, yards lost (1)—Joe Laidlaw 1-12. Tackles/assists—Blair Peck 16/2; Shane Bingham 9/2; Caleb Cenarrusa 8/5; Tim Hoopes 8/3; Joe Laidlaw 7/4; Glen Andrews 7/2; Francisco Gamino 6/1; Chance Chavez 5/0, Charlie Rivera 4/0; Brandon Dilworth 1/1.